Here’s the obituary of one of my ancestors, whose mother was a Cavers. He was one of 10 children, 4 of whom had Cavers as a middle name. He grew up in Hawick and in later life settled at Melrose, also in Roxburghshire, to be a farmer. Here’s another obituary of an ancestor, this time another great-great grandfather. DEATH OF A WELL-KNOWN FARMER.- We regret to learn of the death, following an accident, of Mr Thomas C Hall, for over 20 years tenant of the farm of Gattonside Mains. On Thursday last Mr Hall had just left the farm-house to drive over to Melrose, and when not far from the steading he was pitched on to the road and rendered unconscious. He died on the following Saturday. Mr Hall was a successful farmer, and was well-known at the various sale rings. Just posted this to my general-purpose ancestry blog, but it’s a place where Cavers people (including my own ancestors) were buried too, so of interest to Cavers researchers as well. For much of my childhood I lived in the Wilton side of Hawick, near where my ancestors had lived for generations. I didn’t realise, though, that on my way to and from Wilton Primary School I was crossing the site of the Wilton Old Church and graveyard, which was cleared almost completely in the 1950s. Generations of my Hall and Cavers ancestors would have been buried there, and when the site was cleared there were still legible gravestones for some of the very earliest known Cavers ancestors. In addition some Usher relatives were buried in part of the crypt. 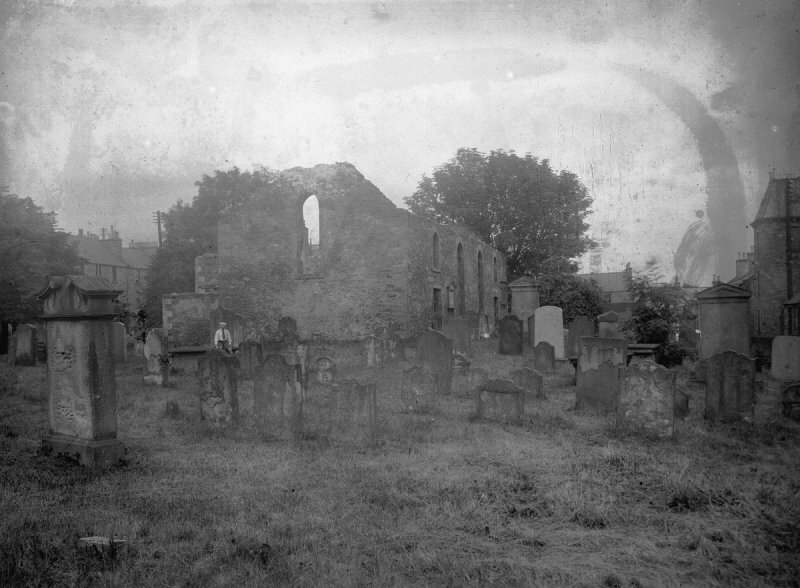 I’ve just, thanks to the Royal Commission on the Ancient and Historical Monuments of Scotland website, had my first glimpse of what Wilton Old Church and graveyard looked like before the site was cleared. It’s eerie, a glimpse into the past.